There aren’t many places in the world where you can examine an accretionary complex of a subduction zone, straddle a transform plate boundary, view the surface rupture zone of a major earthquake, examine the granitic basement of a continental magmatic arc, and investigate the petroleum exploration potential of a major basin all in a single day. 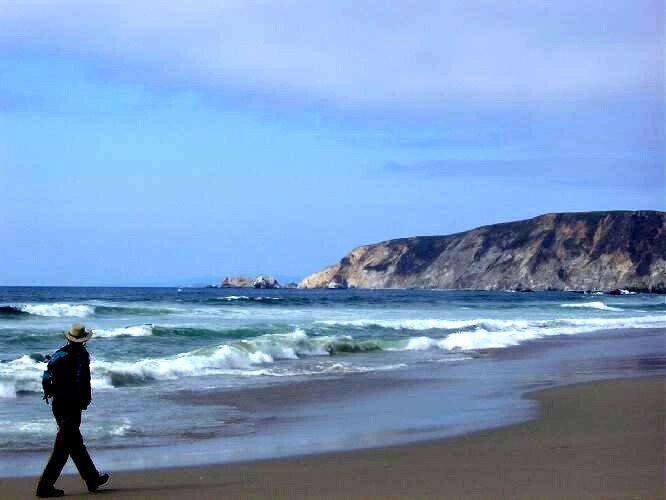 However, the Point Reyes area of northern California is one place where it can be done easily and in a setting of great natural beauty. On Saturday, September 27, NCGS members and friends joined field trip leaders Tom MacKinnon and Rusty Gilbert for a day of field work. Tom worked for ChevronTexaco for 21 years and is now a consultant for them on a part-time basis. 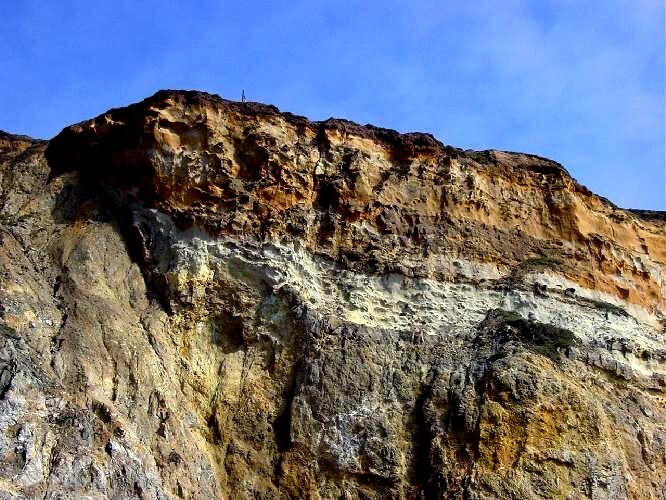 He has spent several years working on the geology of the Monterey Formation in California. Rusty has worked for ChevronTexaco for 23 years and is currently Team Leader for the Stratigraphy and Geostatistics Team with ChevronTexaco’s Energy Technology Team. He has spent several years working on various California offshore lease sales during the 1980s. Our day began on at the Larkspur Ferry Terminal. Over coffee and donuts (unfortunately not Krispy Kreme) supplied by Phil Reed, we had a brief overview of the day’s activities. The first three stops would be in the Franciscan Complex on the North American plate, the fourth stop would be on the San Andreas plate boundary, and the last three stops would be on the Salinian Block on the Pacific plate. Tom began by giving us an overview of the Franciscan Complex. The Franciscan Complex is a package of rocks formed in an eastward-dipping subduction zone. Ages range from Late Jurassic through Miocene. During that time period the Farallon plate was being subducted beneath the overriding North American plate. Rock units consist of sediments deposited in an accretionary prism (imbricated ocean trench deposits) as well as the sections of the underlying oceanic crust and mantle. 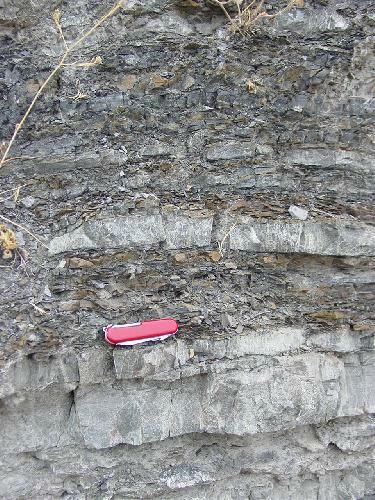 The sediments of the accretionary prism are medium- to fine-grained detrital rocks (graywackes, micrograywackes, and dark mudstones) sourced mainly from the Sierran magmatic arc, and deposited into the trench as turbidites. In the subduction process they have been metamorphosed into metagraywackes and shales. The ocean floor rocks are radiolarian chert, pillow basalts and pillow breccia, and peridotite (oceanic mantle). These have been metamorphosed into metachert, greenstone, and serpentine, respectively. Broadly speaking, the Franciscan complex is about 100 km wide and can be subdivided into three belts from west to east: the Coastal Belt, the Central or Mélange Belt, and the Metamorphic or Yolla Bolly Belt. The ages of the belts decrease from east to west reflecting the accretion of successively younger material to the North American plate. The metamorphic grade within each belt also decreases from east to west ranging from blueschist facies in the Metamorphic Belt to zeolite facies in the Coastal Belt. 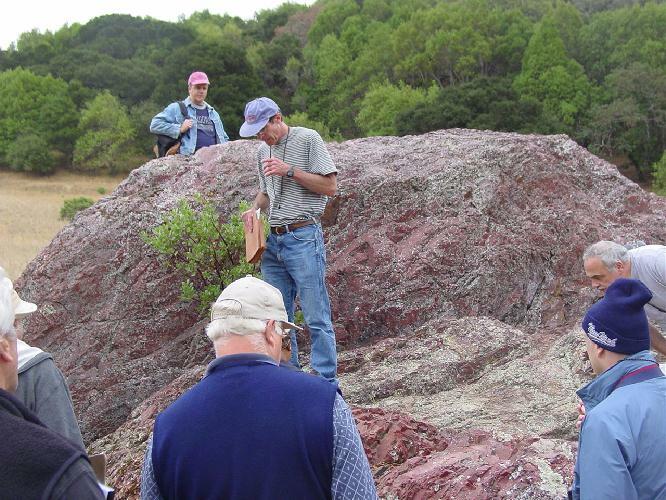 On a previous trip in the spring with Gary Ernst we examined the eastern Metamorphic Belt. On this field trip we would spend the morning in the Central Belt. 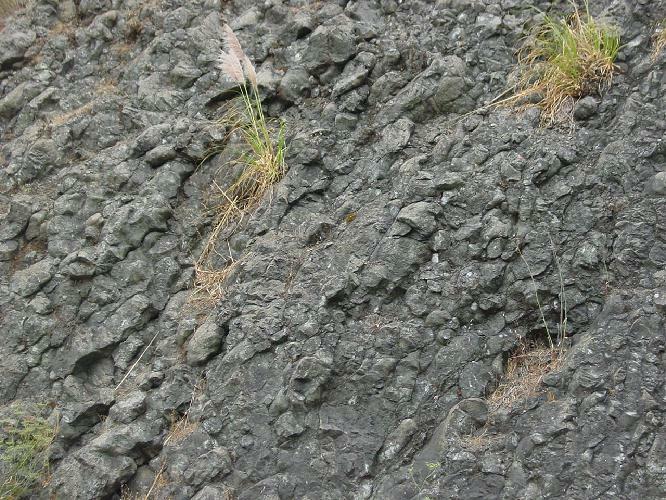 Much of the Central Belt is primarily sheared mudstone matrix (argillite), within which are mixed large blocks of lithic sandstone (greywacke and metagraywacke); smaller blocks of chert, greenstone, and serpentinite; and with lesser amounts of limestone, amphibolite, blueschist, and eclogite. Recent work by Blake and others of the USGS has subdivided the Franciscan of the Central Belt in the Marin County area into eight discrete tectonostratigraphic terranes. This approach to mapping in the Franciscan was discussed at Stop 3. 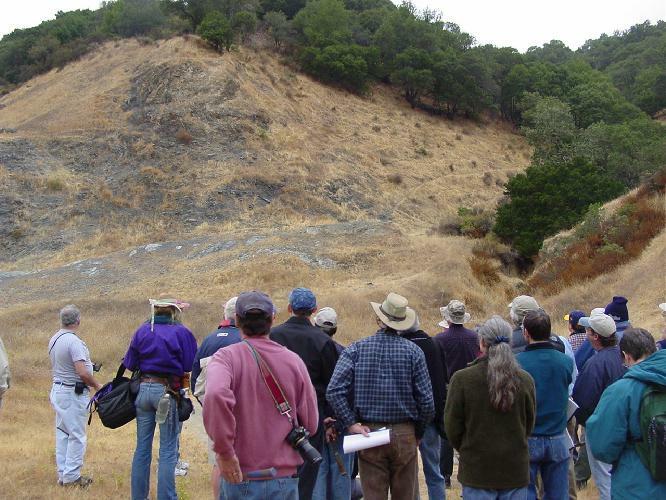 Stop 1 was at the Novato quarry on Ignacio Boulevard to see a unit called the Novato Quarry terrane. Here we saw several packets of well-bedded sandstone and shale that had been sheared and folded such that each had a slightly different strike and dip. This is a structural style called “broken formation,” and it is characteristic of the Franciscan. In each packet the sands are mainly thin-bedded turbidites deposited in deep water. Nearby we saw an isolated block of red chert surrounded by sheared mudstone. 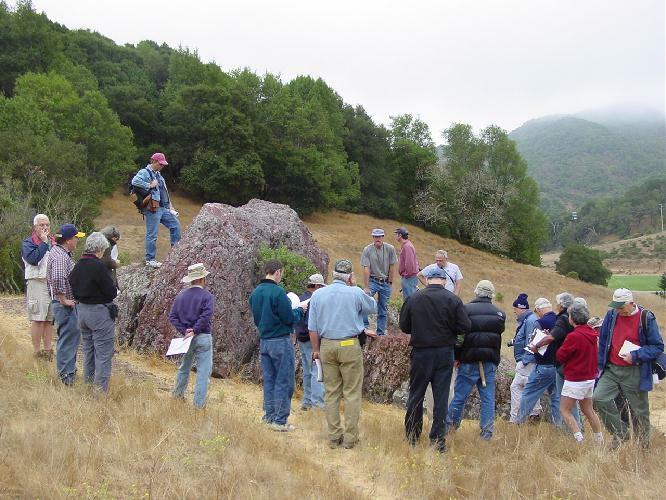 Stop 2 was along Novato Road to see the distinct topography typically associated with Franciscan mélange. 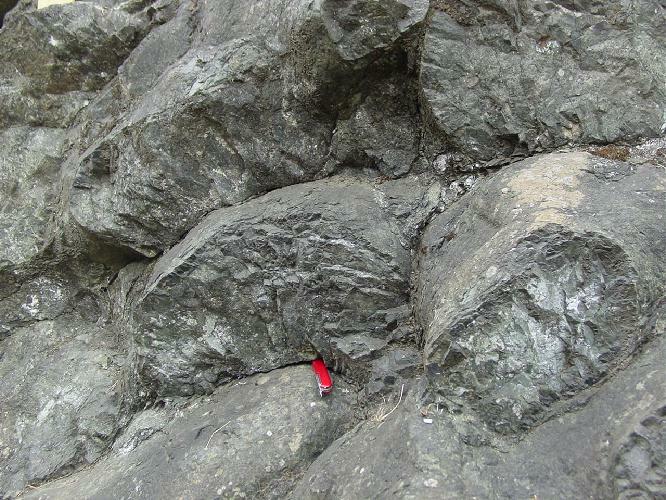 Isolated blocks of resistant Franciscan rocks of various types (known as knockers) were mixed into a sheared mudstone matrix. 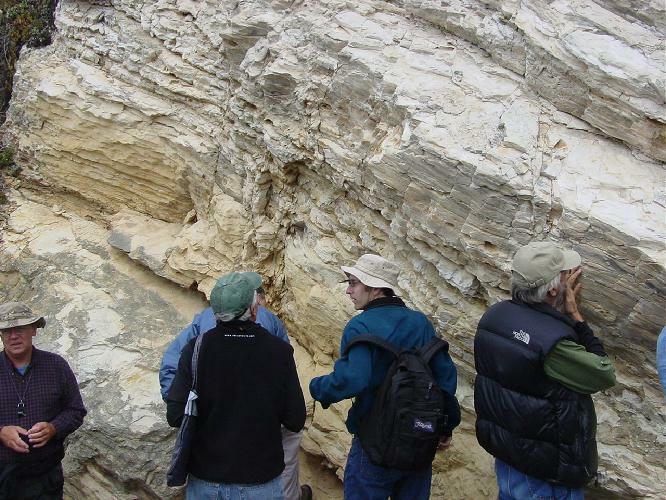 Ron Crane led a discussion about whether much of the mixing was done tectonically (and therefore these units would be called mélanges), or whether the mixing was done by soft sediment slumping such as would occur in submarine landslides (and therefore the units would be called olistostromes). Both processes undoubtedly operated. Stop 3 was on Petaluma Road to see a unit called the Nicasio Reservoir terrane. This unit is also called the Black Mountain volcanics. This is one of the best exposures of pillow basalts anywhere in the Franciscan and possible anywhere in California. Here the tube-shape nature of the pillows can be seen in three dimensions. The total thickness of the volcanic pile is 1-2 km. This unit may have originated as a seamount that was scraped off the descending plates and incorporated into the trench accretionary material. At Stop 3 we had a discussion of the terrane concept as it applied to mapping stratigraphic units within the Central Belt. Some authors such as Dickinson have argued that the Franciscan is a relatively straightforward subduction complex, and that most of the accreted material in the Franciscan was locally derived from the continental magmatic arc. Other authors such as Blake and Jones have argued that much of the Franciscan originated as unique tectonostratigraphic terranes located far to the south. These terranes were then carried long distances northward by strike-slip faulting before being emplaced in the accretionary wedge. In the absence of unequivocal evidence for a unique stratigraphy and long distance transport for most of the material, it may be simplest to consider the terranes to be only convenient mapping units. Stop 4 was at the Point Reyes Visitor Center where we were joined by a troop of Boy Scouts working on their geology merit badges. 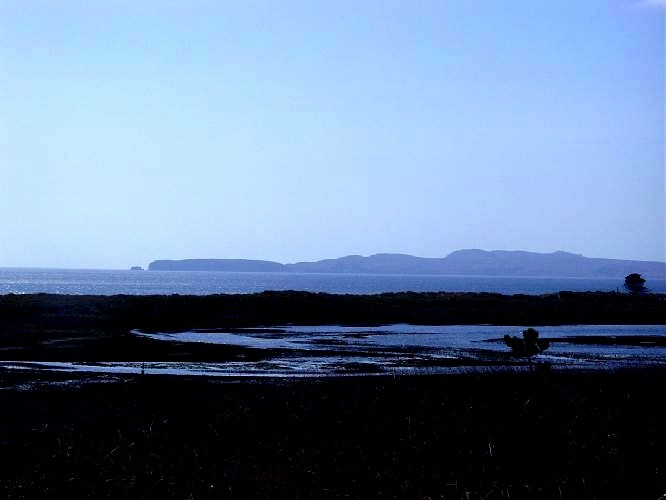 The San Andreas Fault comes ashore to the southeast in Bolinas Lagoon, passes near the Visitor Center, and exits to the northwest in Tomales Bay. 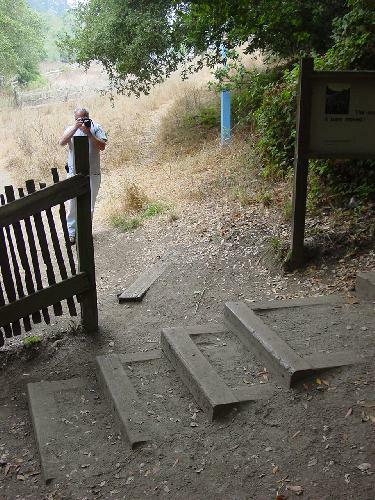 By hiking the Earthquake Trail it is possible to walk along the trace of the San Andreas Fault, to straddle the boundary between the present day North American and Pacific lithospheric plates, and to see some of the effects of the 1906 earthquake. Seismologists have used seismic waves recorded at the time to relocate the epicenter of the 1906 earthquake to a position west of the Golden Gate. From there the rupture spread out to the northwest and southeast. However, the maximum fault offset (about 18 feet) was recorded nearby at the head of Tomales Bay. The blue posts have been placed along the trace of the San Andreas Fault. We walked along the Earthquake Trail to see a portion of the San Andreas Fault that ruptured in the great (magnitude 8.0) earthquake of 1906. 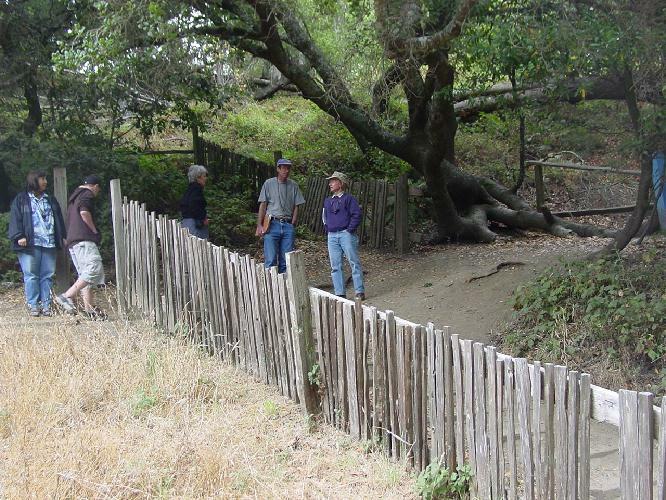 The 1906 rupture trace is still visible as a “bench” on the side of a hill, and the famous “offset fence” with its 16 feet of displacement has been reproduced on the Trail. 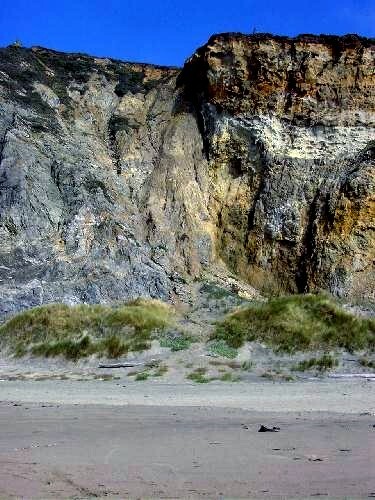 When standing along the fault trace it is difficult to resist imagining what it would be like to be standing there during the next big earthquake, to see the rupture occur, and to see the offset develop. After some discussion about the 1906 earthquake, its effects, and the probabilities for future events, we ate lunch in a grove near the trail. Stop 5 was at Kehoe Beach at the northern end of Point Reyes peninsula. For the remainder of the afternoon we would be on a section of the Pacific plate known as the Salinian Block. The Salinian Block has a completely different geology from what we saw in the morning. 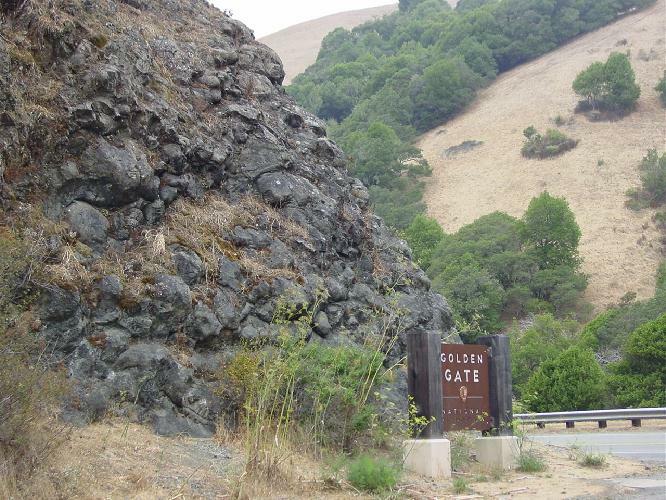 The basement of the Salinian Block in the Point Reyes area is composed of three different granitic bodies: tonalite of Tomales Point, granodiorite and granite of Inverness Ridge, and porphyritic granodiorite of Point Reyes promontory. 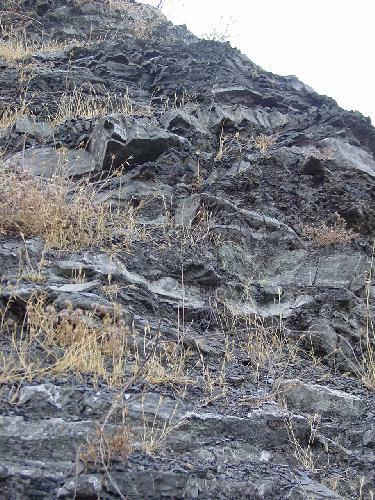 The granodiorite is intruded by numerous light- and dark-colored dikes. The Salinian basement here is all Late Cretaceous age and is considered to be a piece of continental plutonic arc similar to the roots of the Sierra Nevada. This basement is interpreted to have moved to its present position by northwestward motion along the San Andreas Fault starting about 29 m.y. ago (with additional movement prior to the Eocene on a “proto-San Andreas Fault”). The granitic rocks of the Salinian basement are nonconformably overlain here by a sequence of middle to upper Miocene sedimentary rocks. This sequence consists of a transgressive basal sandstone unit, the Laird Sandstone, and an overlying deepwater unit, the Monterey Formation. Here the Monterey Formation consists of mainly siliceous mudstone with some porcelanite and shale. The Monterey Formation was formed mainly from diatoms, planktonic organisms composed mostly of silica. 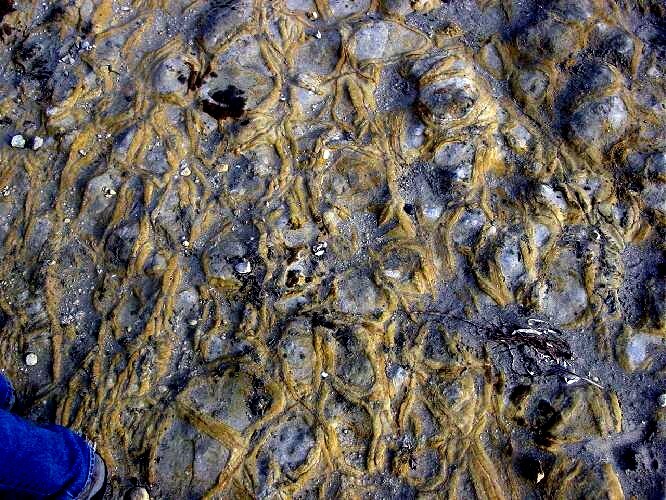 These diatomaceous sediments were deposited as turbidites derived from slumps on the slope. Porosities of the altered diatomites can be as high as 35%, and a fresh surface on a hand specimen will stick to your tongue! It is used for swimming pool filters and kitty litter. Prior to about 5.5 m.y. the motion along the San Andreas was slightly extensional as well as strike-slip. This transtensional motion formed deep basins that were filled with thick section of clastics. 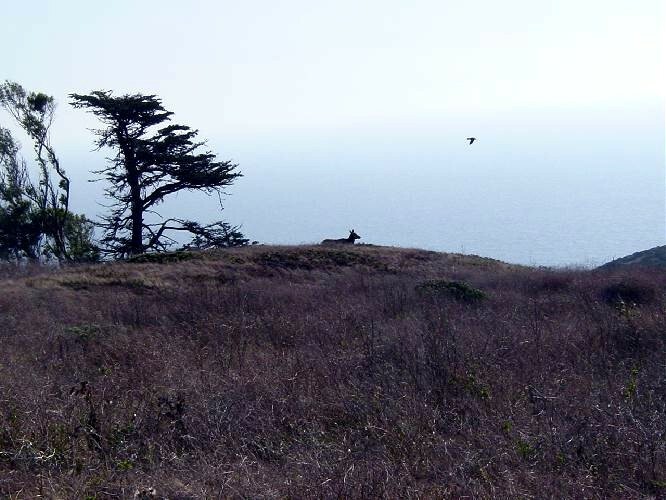 The total thickness of Monterey on the Point Reyes peninsula is estimated to be about 3500 to 5000 feet. Rusty gave a summary of the petroleum exploration history in the area. He noted that although onshore oil seeps in the Monterey Formation were observed near Bolinas, it was the offshore basins that were thought to have the greatest potential. The Monterey Formation is both the source rock and the reservoir rock for most of the oil in California. Production is from fracture porosity and permeability. The first offshore lease in federal waters occurred in 1963. In the Bodega Basin and Outer Santa Cruz Basin twelve wells were drilled. The wells encountered hydrocarbon shows, but no significant oil was discovered. All were plugged and abandoned. Since then no other exploratory drilling has taken place, and since 1990 no future leasing will be allowed in these waters. Stop 6 was at Drakes Beach on Point Reyes peninsula. Here we saw the diatomaceous mudstones and siltstones of the upper Miocene/Pliocene Purisima Formation. The Purisima was deposited in shallow water and has spheroidal carbonate concretions commonly containing cetacean (whales, dolphins, etc.) bones. 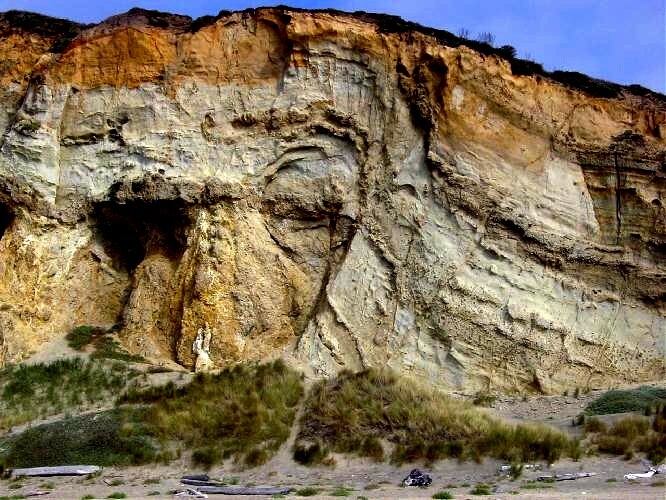 Another interesting sedimentary feature of the Purisima Formation is a beautiful example of a dewatering structure. The rims are distinct from the interiors, and together they form a tile-like mosaic along the bedding plane. Stop 7 was at the lighthouse lying at the tip of Point Reyes peninsula. 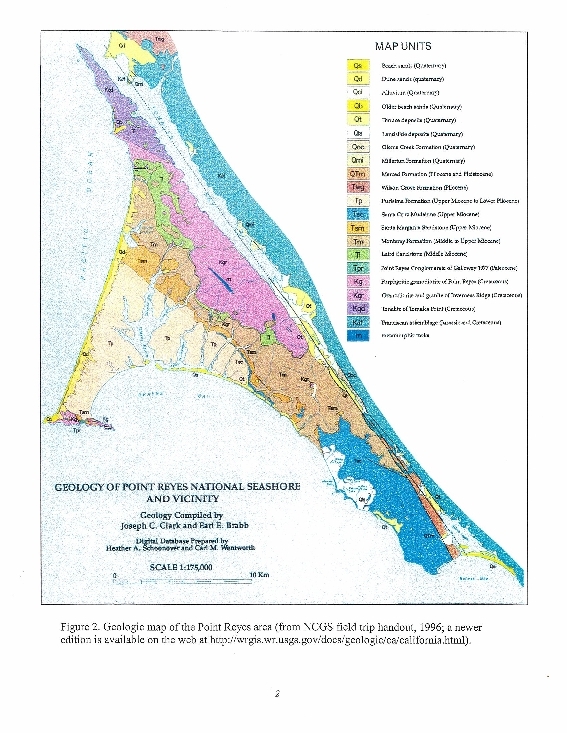 The peninsula was formed by mass of resistant granodiorite basement and is capped by the Early Eocene Point Reyes Conglomerate. The conglomerates are quite colorful and consist of salt- and pepper-colored granodiorite clasts, purple and black porphyritic volcanic clasts, light-colored quartzite pebbles, red chert, and green volcanic pebbles. This unit consists of both conglomerates and sandstones deposited as turbidites and debris flows in deep water. These beds were deposited in a submarine channel that was cut into the underlying granodiorite. The outcrop here appears to be the same age and lithology as the Carmelo Formation at Point Lobos (near Monterey). These two units may have once been contiguous, but have now been displaced northward 150 to 185 km by movement along the San Gregorio Fault during the Tertiary. We ended the day just as the sun began to set. We were fortunate to have good weather throughout the day, and we managed to avoid the fog and cooler temperatures that often occur along this section of the coast. The NCGS sincerely thanks Tom MacKinnon and Rusty Gilbert for this excellent field trip. Their field guide describes the trip in detail and includes several colored geologic maps and photographs of the area. We thank Jean Moran for another wonderful job in organizing the trip, handling trip registration, arranging transportation and food. Finally, we thank all of the drivers for use of their cars and vans.